Businessman Percy Sutton served as an intelligence officer for the famed Tuskegee Airmen in World War II. (CNN) -- Civil rights attorney Percy Sutton, who represented Malcolm X and became an influential New York politician and broadcaster, has died at age 89, associates said Sunday. As a businessman, Sutton was credited with leading the revitalization of Harlem, including the restoration of the famous Apollo Theater. In a statement issued after Sutton's death Saturday night, New York Gov. David Paterson called the former Manhattan borough president "a friend and mentor." "Percy was fiercely loyal, compassionate and a truly kind soul," Paterson said. "He will be missed, but his legacy lives on through the next generations of African-Americans he inspired to pursue and fulfill their own dreams and ambitions." And in a statement issued by the White House, President Obama called Sutton a "true hero to African-Americans in New York City and around the country." His career as an entrepreneur and public servant made the rise of countless young African-Americans possible. "His life-long dedication to the fight for civil rights and his career as an entrepreneur and public servant made the rise of countless young African-Americans possible," Obama said. A native of Texas, Sutton served as an intelligence officer for the famed Tuskegee Airmen during World War II before becoming an attorney. He represented Malcolm X until the onetime Nation of Islam leader's 1965 assassination, and continued to represent his widow, Betty Shabazz, until her death in a 1997 fire. He then defended Shabazz's 12-year-old grandson, who admitted to starting the fatal blaze. In the 1970s, Sutton was a member of the Harlem circle dubbed the "Gang of Four," which included U.S. Rep. Charles Rangel; Paterson's father Basil, who became New York's secretary of state; and future New York Mayor David Dinkins. He served as Manhattan borough president from 1966 to 1977, and New York Mayor Michael Bloomberg ordered flags at city offices to fly at half-staff on Monday. "It's hard to capture in just a few words how important Percy's contributions were -- and just how unique an individual he was. He helped move African-Americans and all of New York forward," Bloomberg said in his declaration. After public office, Sutton became an African-American broadcasting pioneer by purchasing radio stations WLIB and WBLS, launching the first radio chain aimed at black listeners, civil rights leader Al Sharpton said Sunday. "He was at the forefront of everything you can think of in black America," Sharpton told CNN. "He was the quintessential black American. 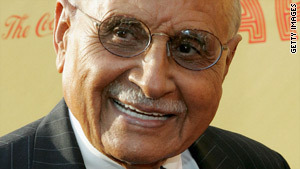 He pioneered black business, black media and black politics. He opened those doors and he kept them open." Sutton also reopened the Apollo, the Harlem landmark credited with launching the careers of performers from Ella Fitzgerald to Michael Jackson, "when it was boarded up -- when the only ones here were the rats and the roaches," Sharpton told reporters Sunday. "He was suave and eloquent and debonair," Sharpton said. "He had a coolness about him that I think that we will never see the likes of. There was a grace about Percy Sutton that was hard to describe." And Rangel said Sutton "never stopped fighting for our rights and building community, especially in his beloved Harlem." "Percy Sutton wrote his own story, and in doing so, he leaves behind a remarkable legacy of achievement and social justice that will serve as an example and inspiration for generations of leaders, now and forever," the veteran congressman said in a written statement.